Click the button below to add the Egg Pendant, Fabergé style with Pysanky design, chain included to your wish list. Egg Pendant, Fabergé style with Pysanky design, approx. 5/8", includes 18" silver-tone chain. Crafted in sterling silver and enamel, and enhanced by semi-precious stones in the Pysanky style. Delivered in a velvet box with satin lining. 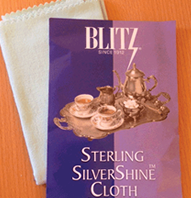 The Blitz Sterling Silver Polishing Cloth cleans, polishes, and applies a tarnish retardant (great for both silver and gold jewelry). The 100% cotton flannel cloth is thoroughly impregnated with non-toxic cleaning and polishing agents especially formulated for sterling silver and silverplate and contains tarnish retardant. Contains no harsh chemicals or abrasives. Add the Blitz Polishing Cloth to your order.